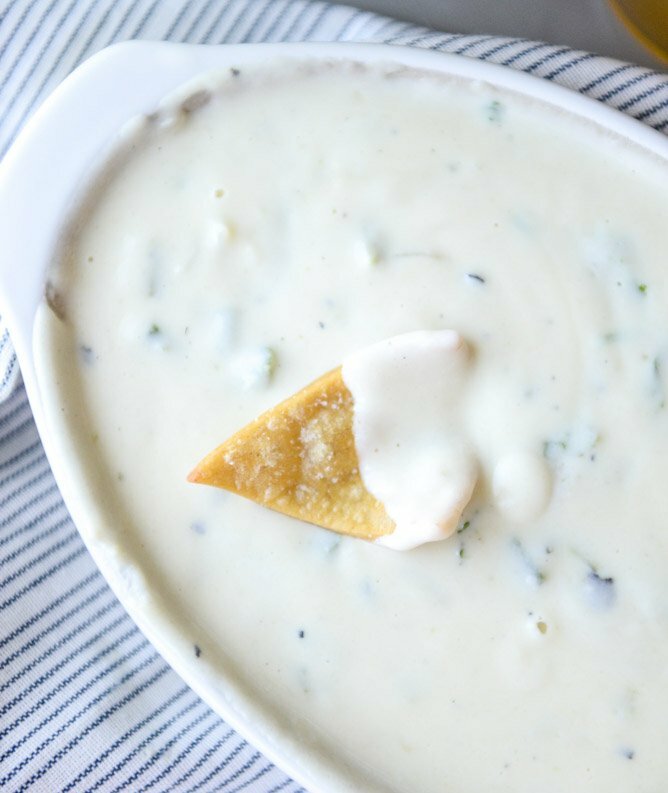 Roasted Green Chile Queso Cheese Dip. Oh hey! Want to eat queso together? I mean, it’s Thursday. Thursday is the BEST day of the week. No, it really is. The anticipation of the weekend is just hanging in the air. It isn’t quite Friday yet and it’s certainly not Sunday and full of the blues. Plus, when you’re in college you learn that Thursday is basically the start of the weekend. It just IS the weekend. Green chile queso!! It’s superior to all other queso tastes, I have decided. Can I be a queso taster? Uh. Also. I can’t stop making these chips. 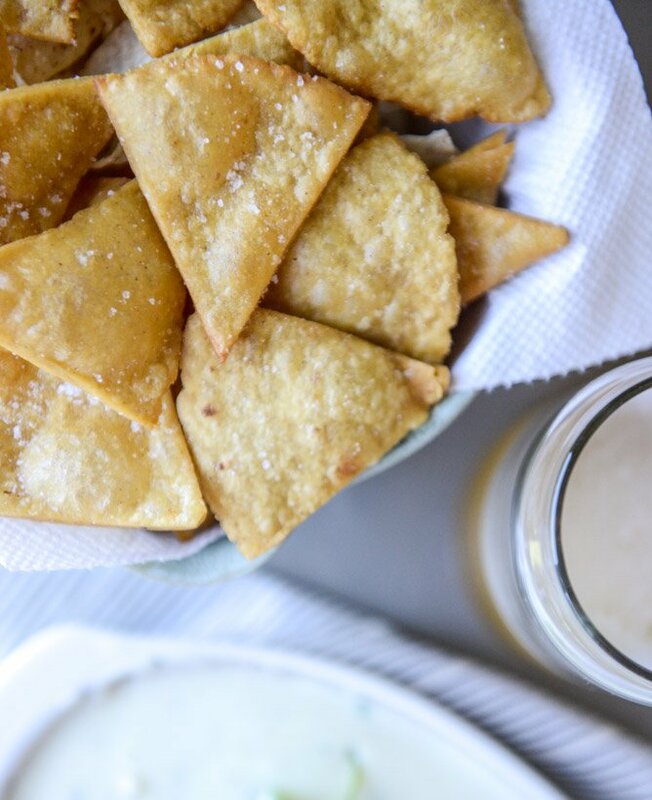 I don’t even really want nachos these days unless I’m making homemade corn tortilla chips. Hot out of the pan, sprinkled with salt and left to crisp up until crunchy and puffy and wonderful. Dip that in queso. I don’t even know how I’m still aliiiiive. So I know I’ve made cheese dip before. 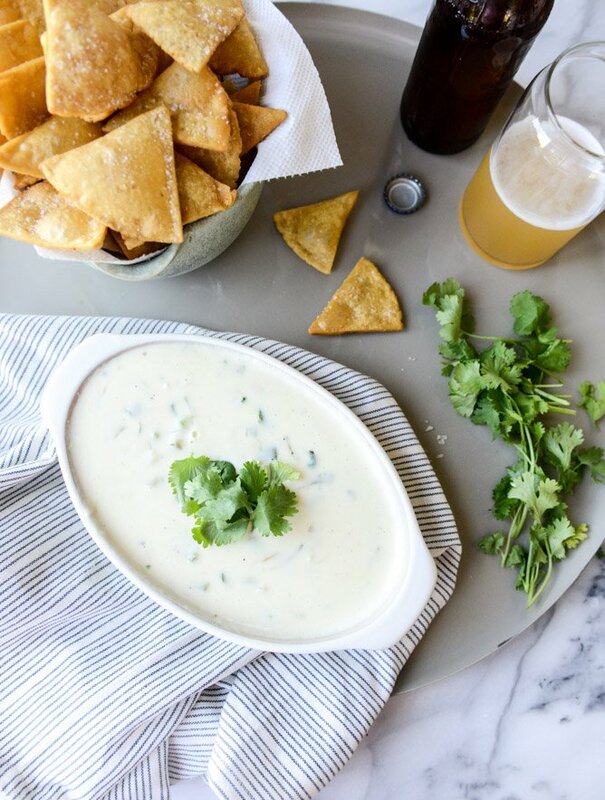 I’ve even made a full recipe dedicated to beer queso and multiple other queso drizzles. This queso is DIFFERENT. I swear that it really is. Also, many places say the best queso is made with velveeta and I don’t 100% disagree because it works… but, ugh. I super love real sharp cheddar cheese. Freshly grated because it makes the best melt! You can totally keep it creamy too. It’s a little high maintenance (stirring, warming, etc) but hello, it’s queso. 4 green chiles, I used anaheims! 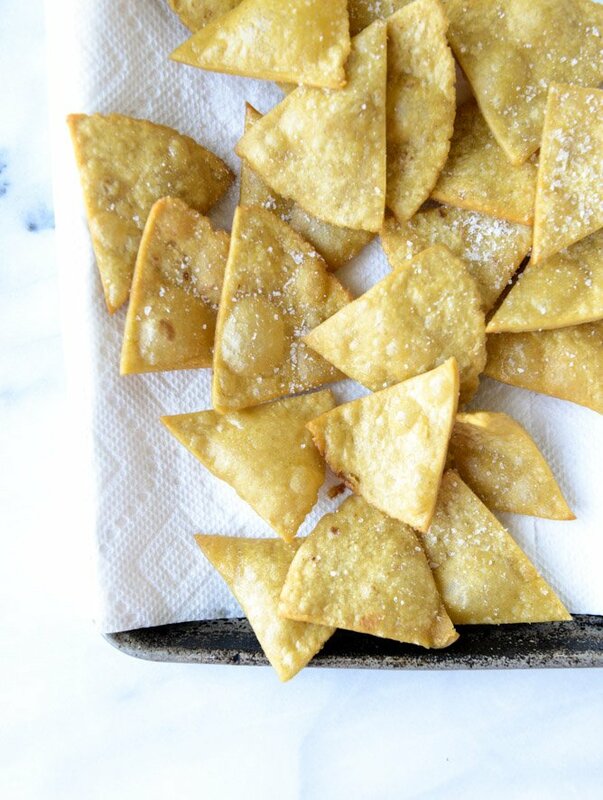 homemade tortilla chips for serving! Once the peppers have “steamed” in the bag, remove the blistered skin. Slice off the tops and remove the seeds (unless you want tons of heat), then dice the peppers. Heat a saucepan over medium heat and add the olive oil and butter. Stir in the peppers, onions and garlic. Season with the salt and pepper. Cook until the onion softens, about 5 to 6 minutes. Slowly stream in 1 cup of the half and half, whisking the entire time. In a bowl, whisk together the remaining 1/2 cup half and half and cornstarch until no lumps remain to create a slurry. Stir the slurry into the saucepan and cook for a minute until the milk thickens. Redeuce the heat to low. 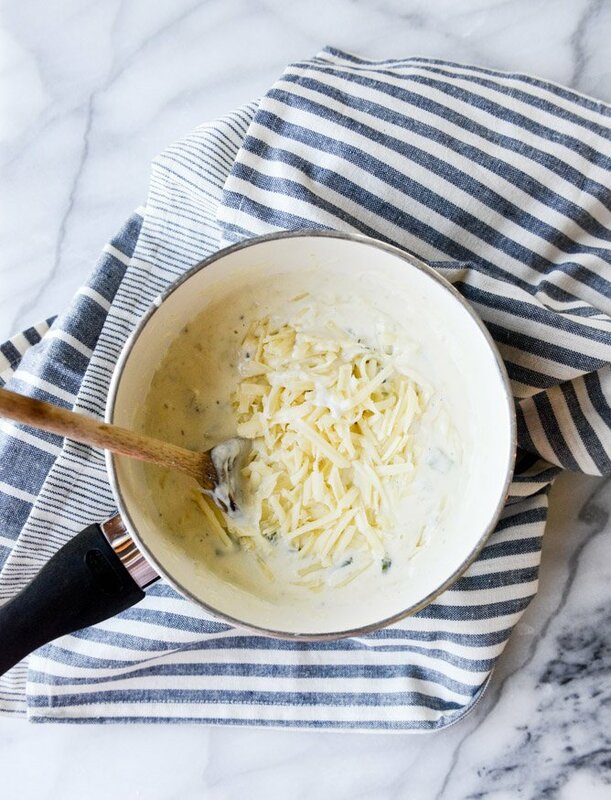 Stir in the grated cheese, one small handful at a time, until melted. Transfer the mixture to a crock, larger bowl or a small crockpot heating on low. Top with fresh cilantro if you’d like. Serve immediately with chips! 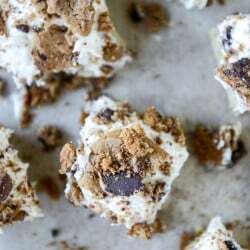 Chocolate Chip Cookie Crunch Cake with Brown Butter Cream Cheese Frosting. Haha, I laughed out loud when you said “no rotel” Heh. That’s great. And yes, fine we’ll go with the green chiles and for once skip those red peppers I really like. Read that Thursdays are the day of the week that most people are happiest in the workplace and it’s the day to approach something if you want a favor. Just saying. MMMMMMMMmmmm! How is it possible that I can almost smell this just from looking at the pics? It sounds so good right now, totally gotta make it! Haha you described my feels about Thursday perfectly. It totally is the best day! I’ve been craving queso recently this is totally happening on Sunday! Oh my!! This looks fabulous. My husband and I can’t make it a week without making homemade nachos. He loves that velveeta queso, but I am not a fan. I do however love a good green chili queso like this one. Looks like a winner to me! Yes I do want to eat that wit you haha. Or alone so nobody can judge me because I ate too much of it hahaha. And omg Thursday was already a weekend in college, sadly now we still need to work on Friday. In any case this is great for any day of the week. Oh this looks delicious! Queso is truly a kryptonite for me. I can’t wait to make this for football season! Oh man. 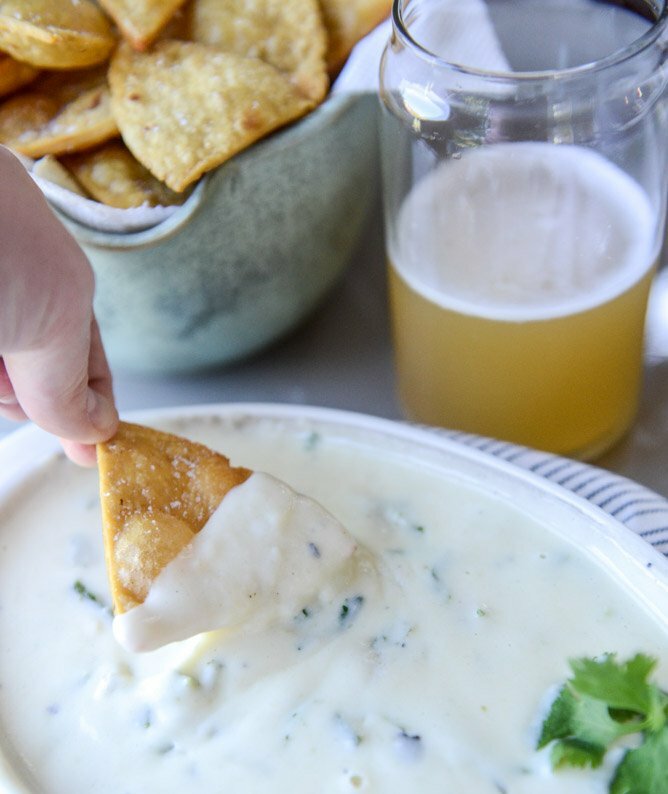 I love the white cheese dip at Mexican restaurants and this looks even better. If I make this will I be unable to go back to the big 2-pack from Costco??? Probably…. Ohhh don’t tempt me. I so need cheese right now. But when am I not craving cheese? This queso looks amazing!! This is one of my absolute favorite appetizers. Can’t wait to make this recipe soon! Aaahhh yes! I was just thinking about trying a recipe for this the other day! I recently moved from the East Coast to Colorado (by way of Texas) and I will never let go of green chile culture. Ever. Also, cheese…! This dip looks amazing! I’m definitely going to have to make this for my husband at some point during football season! Looks delish! (insert heart eyes emoji) Also, happens to be free queso day at Moe’s today, but this looks 2893560564x better! how did i miss free queso at moe’s day? GAH. Do you think this would reheat well if I made it a day or two in advance for a party? we reheated it a few times (in batches) over a couple days. it works and it’s okay, but it isn’t nearly as wonderful and perfect as when it’s first made. if you must make it ahead of time i’d try to make it as close to party time as you can. I could eat this Queso with a spoon! OMG!! This looks soo delicious. I want to drink it and then lick the bowl and make it for dinner, but hubby is going to look at me like ” where is the meat, where is dinner” and think this is just the appetizer. Making tomorrow for movie night. Will fantasize about queso tonight. mmmmm Queso! I used to only order it when we went out. Like ANYTIME I saw it on the menu. Then a friend started dating a girl from Kentucky, so I stole her recipe. And now will borrow this one to show off next time she comes out. Super excited. Everything is better with queso. The end. ¡Fantástica receta! Fácil de elaborar, con buenas fotografías y un resultado delicioso. Muchas gracias por compartila con todos/as. 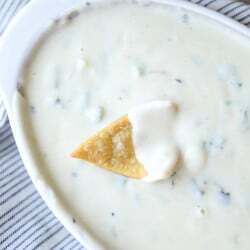 My son loves cheese dip, I can’t wait to have him try this. It will be perfect for football game night. I am so excited about trying this one out. Our family really enjoys green chile recipes as well as sharp cheddar cheese, (though I’ll miss the red peppers, I guess). so this should be a real winner at our house. This looks so perfect for a game night! I hate serving people junk food – I just can’t bear it. This is like junk food – upgraded! I made it last night and I had to substitute the half and half for heavy whipping cream as that’s what I had on hand and it worked out fine. The consistency was creamy and it slowly thickened a little bit as it was getting colder. Added shredded parmesan cheese and cilantro on top. So maybe a combination of half and half and heavy cream would help. definitely agree that thursday is the best – thursday night, preferably! – because once saturday morning arrives, it all flies by too quickly! this queso looks soooo good. making soon. thank you for sharing! Would you just sub one small can green chilies? if you’re talking about the 4oz can, i think you can do 2 cans! but i would drain the liquid/juice out first. Is there any way you would share with us how you make your chips? They look AMAZING!! I’m from New Mexico where green chile basically goes into almost any meal we make, so this is right up my alley! 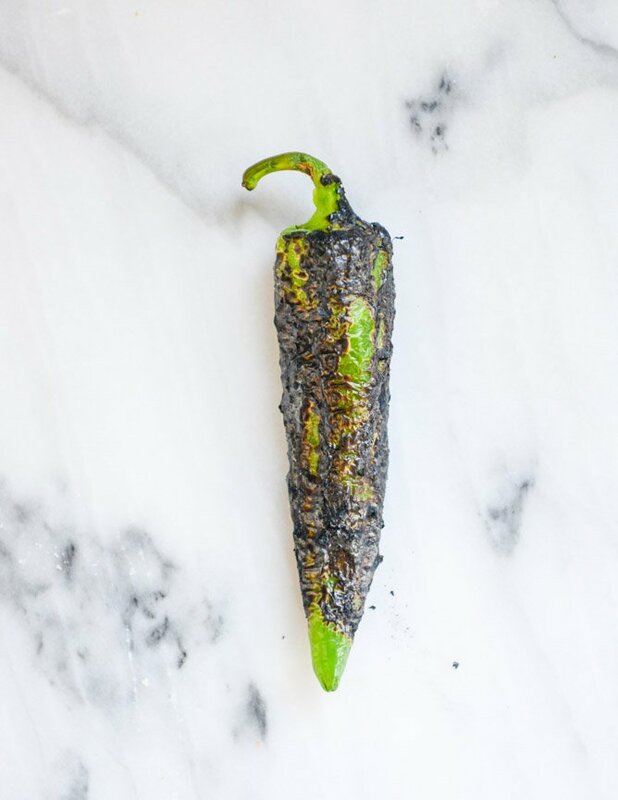 I have a freezer full of roasted chile, so I’ll definitely pull some out for this recipe! I made this for a Super Bowl snack yesterday. It turned out great! OMG yes. Just yes yes yes to all of this. I can’t get monteray jack cheese where I live (at least, I don’t think so. I’m in Islamabad, Pakistan which is kind of a culinary dark spot in terms of availability of ingredient items). Any other substitutes that might work out?